Didn’t think you would ever see a Furuno GPS/Chart Plotter/Fish Finder Combo unit priced under $1,000. Well, as they say… “Never say never,” because now there’s not only one, but two Furuno Combo units that do just that. Furuno just announced an immediate price reduction for both the GP1670F and GP1870F GPS/Chart Plotter/Fish Finder Combo models. The GP1870F now has a MSRP price of $995, while the GP1670F is listed at $695. When you consider that both the GP1670F and GP1870F incorporate Furuno’s multi award-winning, professional-grade fish finding technology, these truly aggressive price points make it appear that you are getting a hi-accuracy GPS Receiver and full-featured C-Map Chart Plotter almost for nothing! These units bring a long list of advanced features, such as Bottom Discrimination, Accu-Fish, C-Map 4D Charts, Internal GPS, and a powerful 600W/1KW Fish Finder.This will be one of the best products Furuno has ever put on the market. Furuno has been awarded the Best Navigation System Award the last eight out of nine years and Best Fish Finder the last 42 consecutive years. With these new prices, everyone can afford to get Furuno’s award-winning technology on their boat! If you have been hoping to upgrade or purchase a new combination unit for your boat, now is your chance to join our other fans. 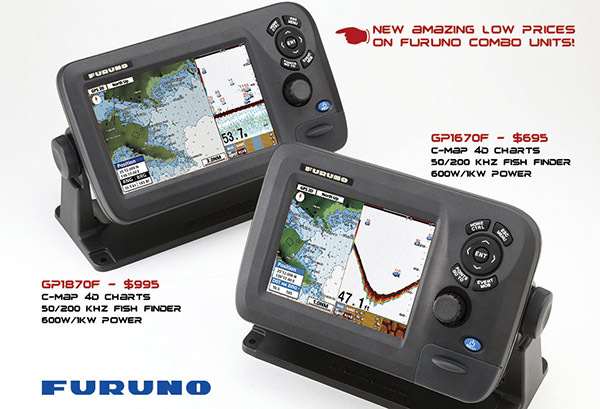 For more information on Furuno’s GP1670F/GP1870F GPS/Chart Plotters, or their many other fine products, visit: Furuno U.S.A..
Digital Switching Systems on Boats – Good, or Bad?